If you're planning a visit to Virginia Wine Country, you're in for a treat. The region has an extraordinary number of top-rated inns, full-service resorts, and other fine lodgings to choose from. On this brief list, find many of the best Virginia Wine Country inns. The best way to tour the area is via chauffeured limousine. That way, you can visit a number of wineries without having to worry about a DWI citation or missing out on the lovely scenery. A stately four-seasons resort on 5,000 acres in the Allegheny Mountains, The Omni Homestead has activities to suit just about every interest. Located beside the Blue Ridge Wine Trail, the property's restaurants maintain a renowned wine collection that consists of vintages from France, Italy, Germany, Argentina, Australia, and New Zealand as well as California, Washington, and Jefferson "Reserve" Chardonnay from Monticello, Virginia. The best-known destination in Virginia Wine Country and a huge attraction on its own, Colonial Williamsburg features a variety of lodging that ranges from the stately Williamsburg Inn, a member of the Historic Hotels of America; to the Colonial Houses, which are furnished with period reproductions and antiques; to the casual, family-friendly Williamsburg Lodge. Built in 1882 to serve passengers at the juncture of the Norfolk and Western Railroad and located right off the scenic Blue Ridge Parkway, Hotel Roanoke is the centerpiece of this easy-going Southern city. A short stroll through its covered walkway leads to galleries, shops, and a farmers market. And just outside the city limits, you can explore Virginia wine country wineries. 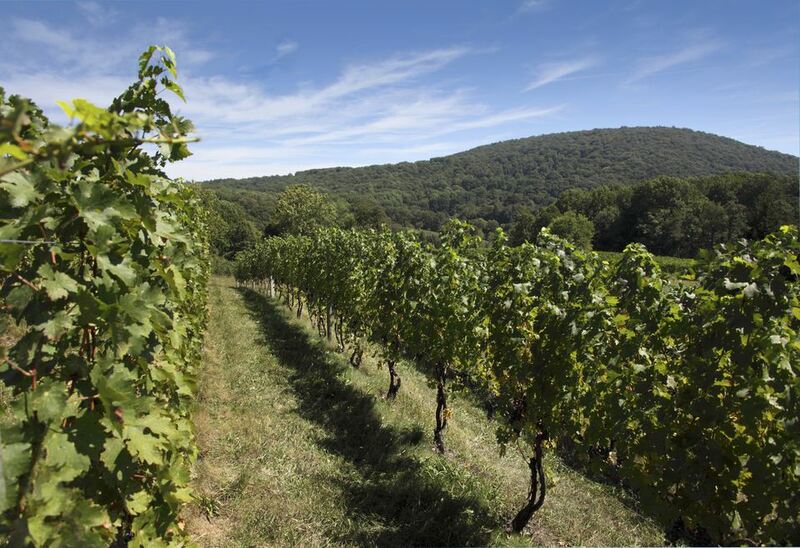 A dozen wineries are located within a half hour of this Virginia Wine Country resort, which is less than an hour from Washington, DC and fifteen minutes from Washington Dulles International Airport. Parents can partake of weekend wine country tours knowing their youngsters will be cared for in the resort’s supervised children's recreation program. A four-seasons resort within the Blue Ridge Mountains, Wintergreen is a casual and comfortable setting for active families. Winter sports range from skiing and snowboarding to the fun of sliding down a 900-foot-long, ten-lane snowtubing hill. This boutique Virginia Wine Country hotel/spa fifty miles from Washington, D.C. indulges guests who treasure the tranquillity of a beautifully decorated suite with toile-printed linens, a goosedown comforter, and a private patio. The outstanding wine cellar at its Manor House Restaurant remains at a constant 55 degrees, thanks to the thick stone walls of the historic building. Especially welcoming to wine lovers, this AAA Four-Diamond-Award-winning Virginia Wine Country Inn provides a tour map of local wineries. More than a dozen are within a thirty-minute drive. Sample wines from the region's vineyards in the Old Mill Room or request a tasty box lunch to take on tour. The Jefferson has been a Richmond landmark since 1895 and its twin lobbies (originally one for women and one for men) is both majestic and well-maintained. Its lavish Sunday Champagne Brunch in the Rotunda lobby draws appreciative fans, thanks to the scrumptious spoonbread and the fresh culinary theme the chef introduces each week. However, some couples may find this historic hotel a bit too fusty for their taste. An intimate Virginia Wine Country hotel with the ambiance of a country estate, Keswick Hall contains a well-regarded gourmet restaurant where guests can select by-the-glass wines from around the world and savor vintage 19th-century Madeiras. Visitors to this winery, one of the largest in the state, can overnight in a soignée suite with a Jacuzzi bath and brick fireplace. There is also a visitor's center with a wine history museum, self-guided tour of the production facility, tasting room, and gift shop that sells prize-winning chardonnays, merlots, and rieslings from the winery.